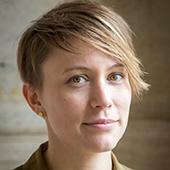 Sara Brown is beginning her 9th year as the Director of Design for MIT Music and Theater Arts. Her designs have been seen at the BAM Next Wave Festival, The Festival d’automn in Paris and The American Repertory Theater in Cambridge. Recent designs include Hagoromo at the BAM Next Wave Festival, Appropriate at Trinity Rep in Providence, and MIT Professor Jay Schieb’s adaptation of Carmen for The National Young Arts Foundation. She encourages students to develop designs that go beyond illustration to provide active environments for performance. Students in her classes explore how design is integral to the dramaturgies of 20th and 21st century theater practitioners. They develop skills in drawing, painting, and model making as well as digital image manipulation and 3D CAD drawing. She mentors students to realize their own designs for departmental and independent projects.